Windows phone SHAREit ka use kaise kare . Android phone se connect karye winphone SHAREit. Jaisa ki aap ko pata hoga shareit media file transfer karne ka sabse popular app hai.ye sabhi ios jaise windows phone me bhi avliable hai. Shareit Android to Android connect karane ka bahut hi simple hai. But windows phone me thoda difficult hai. 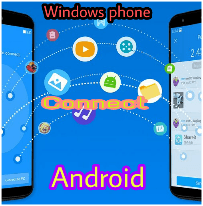 1.-Connect windows phone shareit to Android phone. Yadi aap window phone use kar rahe hai to isme Hotspot ya wifi automatic on nahi hota hai jaisa Â ki Android me hota hai .Aap shareit se media file transfer karna chahte hai to niche diye gaye step ko follow karke window phone shareit Android phone ke shareit se connect kara sakte hai. Pahle shareit on kare window phone ka aur Android ka. Ab windows phone me send ka option chune. Kyu ki agar aap receive ka option per tap karenge to aapka Hotspot on nahi hoga without internet ke. Aur Android phone me receive ka option. Jisse aapke Android phone ka Hotspot on ho jayega. Ab apne windows phone ka WIFI on kare. Winphone wifi on karne per aapke Android phone ka connectionâ profile aajayega. Ab bas us per tap karke connect kar le that’s ok..
Ab aap easily apne file ko transfer kar sakte hai. 2.-Connect shareit window phone to window phone. Shareit tabhi connect hota hai. Jab 1 phone ka Hotspot on hoga aur dusre phone ka wifi, window phone me Hotspot,wifi auto on nahi hota . Hotspot tabhi on hoga jab windows phone me internet hoga. Ab aapke kisi ek window phone ka internet on karna hai. Ab jis phone ka internet on hai uska Hotspot on kare. Aur dusre windows phone ka WIFI on kare. Ab aapka shareit connect ho jayega. Yadi windows phone shareit connect karane me koi problem ho to comment karke puch sakte hai. Phone me new updated check karke update kar lo , is updating me bugs hoga. Aap Backup bana kar reinstall kar de. Kya Error aa raha hai, whatsapp downloading file location change karke phone restart karen. sir window phone main share it connect hota hai but receive main aaps o pice store kha hota pta nahi chalta pleas. Store locations sharit ki Settings me dekh sakte ho. Thanks for sharing informative article. It’s really helpful for us. Reciver ka hotspot on kare phir apne wifi se connect kar le uske baad share kar.